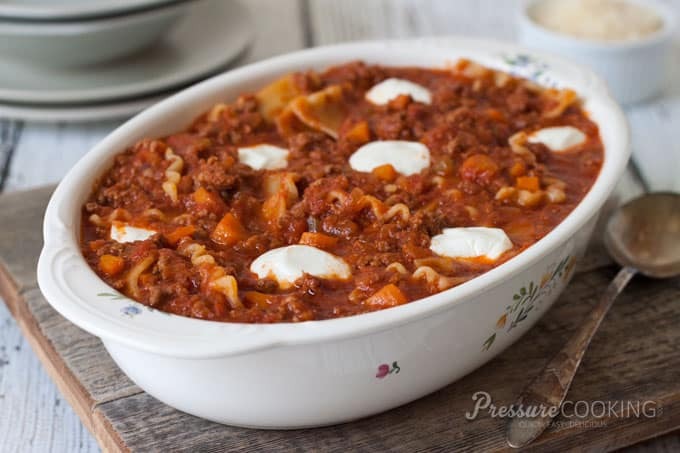 The rich, meaty, cheesy flavors of lasagna in an easy-to-make, one pot quick pressure cooker lasagna casserole.
. The publisher sent me a review copy a couple of weeks ago and I’ve been having fun reading all the recipes and tips she’s include in the cookbook. An Instant Pot is one of the most popular brands of electric pressure cookers. 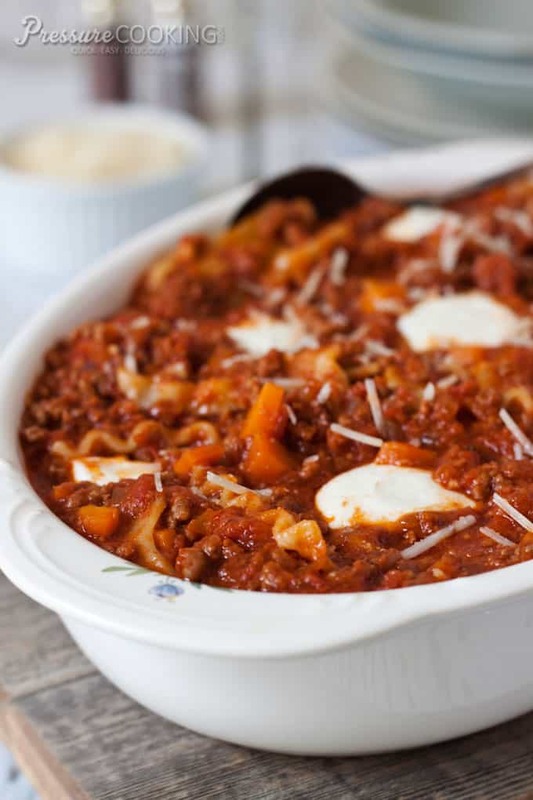 They are easy to use and your Instant Pot can help you create this delicious Sloppy Lasagna! I debated which recipe to try first, but I kept coming back to her Sloppy Lasagna recipe. First you cook the basic meat ragu, a hearty meaty sauce, and then you cook the noodles right in the sauce. It’s such a quick and easy recipe without all the fuss of making lasagna. The recipe calls for 8 ounces of lasagna, which is half of the box of lasanga I had on hand. I just snapped the lasagna strips in to two inch pieces with my hands. Costco was selling individual portions of fresh mozzarella that I bought to keep on hand for snacking and making capresa this summer, and they worked perfectly in this recipe. Although my son said I should cut them in half next time so you’d get more cheese in every bite. My family loved this meal, and I loved how easy it was to make in the pressure cooker with just one pot to clean up. I’m looking forward to trying more wonderful recipes from Laura’s great new cookbook. The cookbook includes recipes for both electric and stove-top pressure cookers. However, what makes this cookbook a must have for every pressure cooker user, are the pressure cooking timetables, tips and information she’s packed in to the cookbook. All that Laura’s learned about pressure cooker over the years, she shares in this cookbook. Select browning and add 1 tablespoon butter and olive oil to the pressure cooking pot. When butter has melted, add the onion, thyme, oregano, salt, and pepper, stirring occasionally, until the onion has softened. Stir in the carrot and celery. Move the contents to the side of the pressure cooker. Add the beef and garlic and stir to break up. Sauté, stirring occasionally, until the beef is brown on at least one side and the juices have evaporated, about 5 minutes. Pour in the crushed tomatoes. Close and lock the lid of the pressure cooker. Cook at high pressure for 18 minutes. When beep sounds turn pressure cooker off and use a quick pressure release. When valve drops carefully remove the lid. Remove and discard the herb stems. Add the remaining 1 tablespoon butter to the sauce and stir until melted. Add the salt and lasagna strips to the sauce in the pressure cooking pot. Pour in enough water to cover the pasta. (I added 1 cup water.) Smooth down the top pieces of pasta so they are submerged. Close and lock the lid of the pressure cooker. Cook at low pressure for 5 minutes, or half the cooking time indicated on the pasta package. When beep sounds turn pressure cooker off and use a quick pressure release. When valve drops carefully remove the lid. Taste the noodles and if you’d like them a little softer, cook on simmer until the noodles are tender. Pour the lasagna in to a large serving dish. 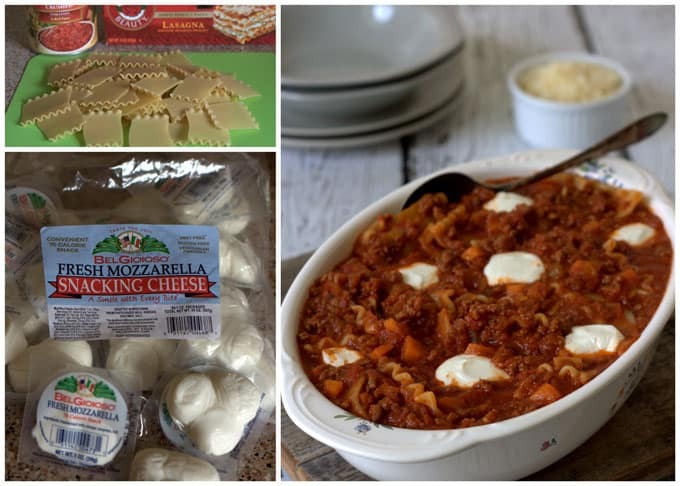 Sprinkle the mozzarella over the lasagna; stir, and let stand, uncovered, for 2 minutes before serving. Be sure and use the minimum liquid recommended for your pressure cooker. If you wanted to double this recipe (not sure if you can in an 8-quart Insta Pot), but if it fits, do you double the cooking time? Hi Carlos – I haven’t tried it, but it should work well in the 8 quart Instant Pot. This looks interesting. Every other receipe I’ve seen for lasagna requires an inner pot. Is this cooked directly in the IP? Hi Kathy – yes, it’s made right in the pot. Its more of a lasagna casserole than a slice and serve casserole, but it is delicious. you didnt say when to put the mozzarella chunks in (?) after cooking , during the second phase of cooking? Hi Lisa – the mozzarella isn’t pressure cooked. Pour the lasagna in to a large serving dish. Sprinkle the mozzarella over the lasagna; stir, and let stand, uncovered, for 2 minutes before serving. Enjoy! Me as well! Power pressure cooker xl is what i am using. Im trying to figure it out! Ill let you know how it turns out! Use the button with the time closest to the time in the recipe. Here’s more info https://www.pressurecookingtoday.com/how-to-use-the-power-pressure-cooker-xl/ So I would use the meat button and adjust it to 18. Enjoy! Help, I have the power pressure cooker xl and I’m doing lasagna. I’m not sure what setting I use. I was thinking of using spaghetti sauce in a jar for this recipe. Could I just cook the lasagna in the sauce without adding the water? I’m looking for a fuller flavored sauce. Hi Kassie – no, you really need some water since the noodles are uncooked. I’m kind of new to the Instant Pot and am learning about what fits inside it. The dish shown is oval, so I don’t that that would fit. Is that what you used inside your pressure cooker? Is there a tall round dish size that you would recommend? Thanks! Hi Christine – the oval dish shown is the serving dish. This recipe does not cook pot in pot so no worries about having a dish that fits inside the pot. In this post http://www.pressurecookingtoday.com/electric-pressure-cooker-gift-giving-guide/ I have a link to my favorite tall round dish for those recipes that do cook pot in pot. Have fun! Do you use no bake noodle? Hi Debbie – no you don’t need to use no boil noodles.